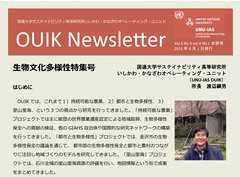 The United Nations University Institute for the Advanced Study of Sustainability, Operating Unit Ishikawa Kanazawa (UNU-IAS OUIK) is a unique organization that was established and has been operated jointly by Ishikawa Prefecture, Kanazawa City and United Nations University. 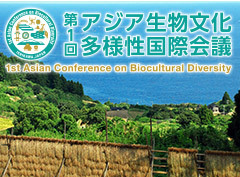 It aims to promote collaborative research for the preservation of biological and cultural diversity, and to develop human resources by linking regional field studies to global discussions. In particular, the unit aims to create the Ishikawa Kanazawa Model, which will function as a platform for various stakeholders in the region to discuss policies while sharing common values. 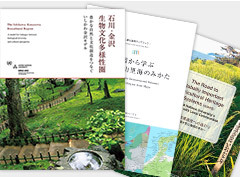 This website provides information about the activities of UNU-IAS OUIK, Ishikawa’s Satoyama Satoumi, and biological and cultural diversity. We hope that it will be used by people who are engaged in activities for handing down these values to the next generation, for the purpose of collecting information and disseminating it worldwide. 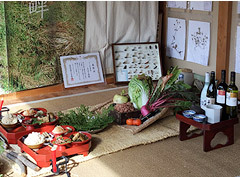 We would also like people overseas to use the website to obtain information about Ishikawa’s sustainable regional development through biocultural diversity conservation efforts. Copyright © 2016 UNU-IAS OUIK, All Rights Reserved.